Last night I supplemented my morning workout with an easy 30 minutes on the treadmill. Whether that will help my leg conditioning is unclear. I'll know better tomorrow morning as I try to generate speed along the course. About halfway through my second treadmill session, it occurred to me that I may have forgotten to register for Sunday's race. I'd never signed up for October's TOB Supervisor's 5K and needed to use my emergency cash to pay on race day. I was concerned that not only had I forgotten to register for Sunday's Turkey Trot, I might have missed the opportunity to do it. Once off the treadmill, I looked for a confirming email from Active, but came up short. I was relieved to see that registration was still open and quickly signed up. The cost of the race was still $20, no penalty for being late to the party. It's a great deal, especially for a 10K. This race is well managed and almost half of the course is run on the boardwalk parallel to the ocean. Compare that to the LI Festival of Races 10K that totals over $40 with "convenience fees" tacked on. 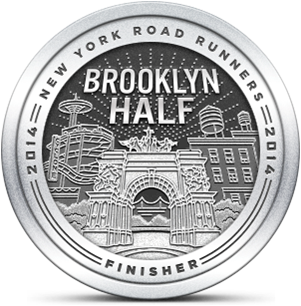 On top of that, the LI 10K's course is as dull as dishwater. 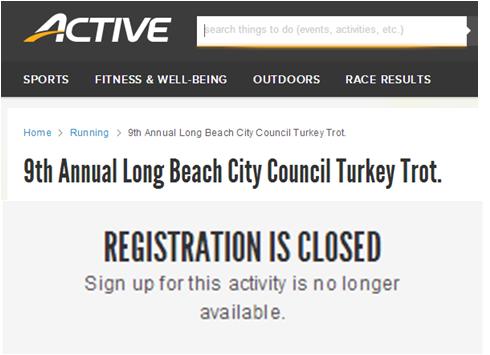 The Long Beach Turkey Trot was cancelled last year due to hurricane Sandy. With the newly restored boardwalk, I'm guessing there will be a record number of participants this year. It's supposed to feel like 12° tomorrow morning, so I have to think about what to wear for the race. I checked the Active site this morning to get the proper start time and saw that registration was closed. Good thing I thought about it last night. I'm excited that I'll get to participate, but I may regret my good luck once I'm standing around in freezing temperatures. Do you have a balaclava? Hope you're able to stay warm. Good luck out there!! I'm sorry I'm going to miss you guys. It could be miserable, but on the other hand we won't overheat! Wish you were joining us, but then again, I don't wish this weather on you (or us : ). I do have one, and I will be sporting it. Oh yes. Thanks for throwing luck our way. I'm looking to come in under an hour. That is all. I wish you were running with us! I was actually thinking about that I'll probably get a high number. That's okay as long as it's not also my finish place. $25 is still a good price. I think any 10K under $30 is fair.